Michel Petrucciani was a musician who constantly searched for something new and expanded his horizon. With his 1989 album Music he began writing for instrumention beyond the conventional piano trio and using synthesizers. On the following album Playground he relied on Adam Holzman--who worked with Miles Davis--more extensively to add new sounds and colors to his music. 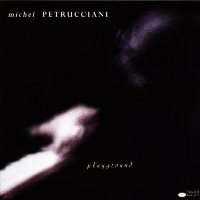 With the powerful rhythm team of Anthony Jackson, Omar Hakim and Steve Thornton, Petrucciani found his own voice as a composer and player in contemporary jazz. Highlights in the program include "September Second" with its beautiful, flowing melodies, and the bluesy and boppish "Miles Davis' Licks," which, as its title suggests, borrows from the music of Davis whom Petrucciani idolized. Recorded at Clinton Recording Studios, NYC, on March 14 through 19, 1991. SHM-CD uses an advanced polycarbonate material for superior sound quality and is compatible with all CD players.